A coverstitch machine is essential for the sewist looking to achieve a professional finish. The CoverPro® 2000CPX's innovative design is based on the marriage of an industrial-style cover hem machine and a convenient home machine. The resulting union has produced a high-speed, long arm, heavy-duty cover hem machine that looks and operates like a sewing machine. With a wide trip cover hem stitch, exclusive free arm configuration and Tension Level Control (TLC). The 2000CPX is the most advanced Cover Hem machine available. Extra large bed space 4"x5.5"
I love this machine. It is very durable. This machine stitches wonderfully! I have no issues and very little tweaking of tensions/settings. While I love my machine the light is ridiculously poor, I have added and led strip to see better. I’ve had my 2000CPX for over a year. I was brand new to coverstitching and excited to learn. I’ve found it to be easy and reliable and it handles everything I’ve put it up to. I love the professional look it gives to the leotards, swimwear and garments I make. I have been very pleased with this machine. A bit of a learning curve at first but joined a coverstitch Facebook group and it helped a lot! I use it everyday I love it! I hated 'changing gears' on my serger. It stopped me from enjoying the garment-making experience; so I went looking for a coverstitch machine to complement my sewing room. 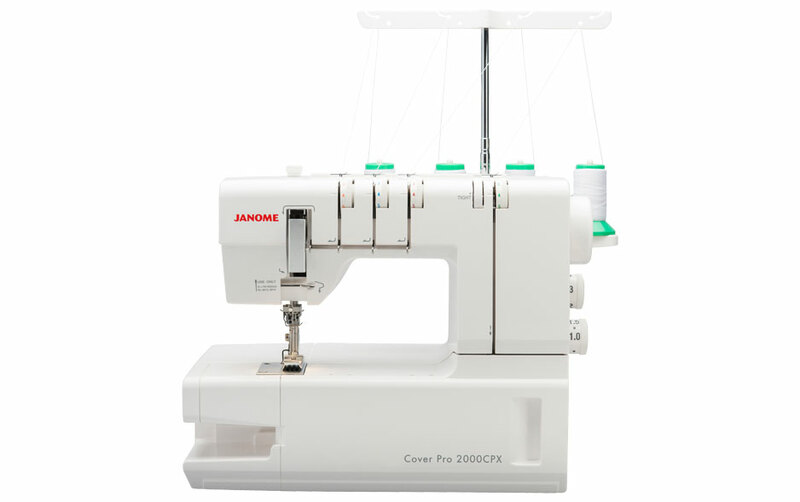 The Janome 2000cpx has proven to be just the right thing--affordable, easy to thread, easy to use, and great performer. Never will be sorry I bought this machine. Perfect machine for me .. I keep it threaded ready to go .. for white fabric at the moment, I love Janome products. Have had many in the past .. Now upgraded to a 15000 . plus I have a 14000. As far as I am concerned the best machine on the market.. Thank you.. I had my machine now for over a year and cannot say enough about it. My sewing is so professional looking. My great grand daughters love their doll clothes and say it looks like you bought them in the store. Now it is fun to sew with knits. Between grand daughter and great grand daughters I have a lot of sewing fun to look forward to...one of them said that is what is keeping me young. I bought this machine in November and unfortunately I have not been able to use it yet. I had many projects to complete before I had the time to play. I am looking forward to diving in very soon. The best compliment I can get is when my customer says “that looks professional “ when I am just an ordinary sewer. It is all due to my CoverPro. I bought this machine last September and have used it A LOT! I absolutely love it. Sews great and it has some speed too! No complaints on quality- I got what I paid for. Great Machine. Still getting used to it. Threading is so easy. I keep this machine at the ready at all times. I bought this machine a few years ago so I could do professional looking hems on stretch fabrics. Absolutely love this machine! It's the perfect compliment to my serger machine. Easy to thread; easy to use.